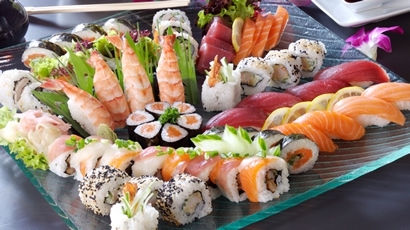 Sushi contains loads of minerals, omega 3 fatty acids, and carbohydrates that keep you energized and healthy. While you may have heard movie stars praising sushi for its tastes and health benefits, there are many risks involved in eating this so-called healthy food. It sometimes contains high levels of mercury or may even have parasites. If you use Western ingredients or dipping sauces to prepare sushi, it will no longer be that healthy, as these sauces and ingredients add fat and calories to it. It is therefore obvious to ask, "How healthy is sushi?" and "Is sushi good for you at all? “Just keep reading to find out everything about sushi and answer to the most common question, "Is sushi healthy?" Okay, if you're looking for a simple answer to your question, "Is sushi healthy?" you will be disappointed. How healthy sushi is something that depends on the type of sushi you're eating. It is generally healthy if it uses loads of vegetables. It may not be that healthy if it has mayo/sauce, is fried, or contains fattening meat. You can however have sushi with veggies and fish without having to worry about negative effects. Take a look at the ingredients it uses. Most of them uses different ingredients, including sea vegetables, simple vegetables, and seafood, etc. Rice, however, is the basic ingredient for all sushi varieties, which have many carbs. Many restaurants now offer sushi made with avocado, shiitake mushrooms, burdock, cucumber, natto, and umeboshi plum paste. You will find it quite healthy actually because plum paste has stomach health-promoting properties, whereas natto helps promote bone health. Similarly, sushi that uses sea vegetables will also offer several health benefits because sea vegetables contain several nutrients, including phytonutrient lignans and minerals such as iodine. Always choose pieces loaded with omega-3 fatty acids as well as the unsaturated fats that boost your brainpower and protect your heart. You should consider ordering sushi that contains tuna and salmon because both are low-calorie foods and are high in omega3s and protein. Opt for sashimi (fresh raw meat or fish sliced into thin pieces) if you're concerned about how healthy your sushi is. Be sure to check the fish doesn't contain mercury. Some great choices include Canadian Albacore, Washington or Wild Alaskan Salmon, and Gulf of Mexico or U.S. Atlantic Mackerel. You may also think of opting for "veggie rolls" when going for a Japanese meal. It is a good idea to order sushi that uses ingredients like avocados, fresh cucumber, and sea vegetables. You will get amazing benefits from sea vegetables because they are high in magnesium, vitamin K, and folate. One great way to order healthy sushi is to opt for brown rice sushi instead of white rice one. Brown rice contains more fiber as compared to white rice, so it is quite beneficial for your digestive system. Brown rice also contains selenium, manganese, and magnesium. You may want to order sushi rolls wrapped in nori, which is dried seaweed and is high in minerals such as zinc, iodine, vitamins, calcium, fiber, protein, and vitamins (A, E, C, and K). Wasabi: A healthy option for anyone who likes spice is wasabi, which is a healthy sushi condiment. This hot paste (green in color) is usually an integral part of sashimi. Wasabi plays a big role in protecting you from food poisoning. It may also help prevent blood clots, cavities, and asthma, but it is not that effective in clearing the sinuses. You will be better off ordering sushi in its basic form, without fancy rolls that use tempura coating, cream cheese or mayonnaise. Opt for soba noodles, especially the ones made from the whole grain buckwheat because it's a high protein, high fiber alternative to your traditional white rice. Opt for reduced-sodium soy sauce if you really want to use sauce. Be sure to eat the pile of ginger you find on your plate because it has antimicrobial, antiviral, and antibacterial properties, and is great for your immune system. It also contains magnesium, potassium, manganese, and copper. If possible, start your meal with a small fiber-rich green salad that uses loads of veggies. You may also opt for a cup of miso soup with tofu, broth, and vegetables. Is sushi healthy? Yes, it can be, especially when you keep the aforementioned points in mind. It is equally important to know the sushi options that you may want to avoid. You may want to avoid sushi that uses fish fried in tempura batter because it's not ideal for your cardiovascular health. Fried fish will increase your risk of developing several heart diseases; in fact, the research suggests that eating a serving of fried fish a week will increase your chances of suffering from heart failure by 48%. You may want to avoid sushi that uses spicy tuna roll or similar stuff. It's mainly because the sushi will contain a spicy mayonnaise sauce that's not great for your health. For a spicier kick, you can always consider using wasabi or ginger. Similarly, you may want to avoid eel rolls, especially if they are served with a sugary soy-based brown sauce because this will add to your calorie intake. You will be loading your body up with calories and saturated fat by opting for rolls with cream cheese. Avoid them! Bluefin Tuna is overfished and contains high levels of mercury. Avoid it at all cost! Swordfish- also avoid it due to its high mercury content. Others include Spanish and horse mackerel, blue marlin, yellowtail sea bass, bonito, etc. Server responsed at: 04/23/2019 12:33 a.m.